On Business Name Upgrade in Nigeria – Between me and a prospective client. Client : Good day Barrister please can you help me upgrade my business from enterprise to a limited liability company? Me: of course I can do that but why do you want to upgrade your business. Me: When was your business registered? Me: Hmmm! okay, have you filed your annual returns up to date? Client: Annual returns? What is that? Let me just stop there for now. This was my conversation with a prospective client yesterday and I thought to share with you what I shared with him after he asked what annual return was. Let me start by saying that whatever is worth doing is what doing well. 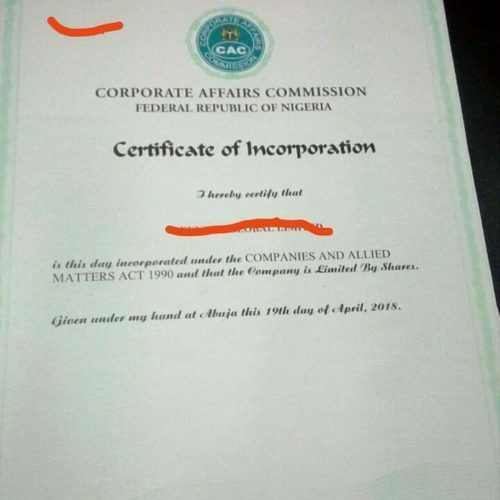 Why settle for a business name registration when what you actually want is a Ltd company registration anyhow you look at it the benefits far outweighs that of a business name. Don’t get me wrong, I’m not saying you can’t register a business name and do excellently well I’m just saying that if you actually want a company with directors and shareholdings clearly stated in it’s memorandum and articles of association why not just start with a company registration already however small? Business upgrade is not automatic, you would have to pay and apply for the registrar general’s consent to upgrade, a consent code will then be given to proceed. You have to also file your annual returns up to date. So for a business registered in 2012, you start paying annual return from 2013 to 2019 That’s 6 years annual returns and you have to pay this before you can even apply for the consent. After filing the the annual returns and obtaining the consent code which takes about a week, you would then need to start the step by step process for registering a company and pay all the necessary fees for registering a new company. So you see that if your reason for opting for a business name is to cut cost you would end up spending more money when you do an upgrade. Rather than do an upgrade you can apply for a cessation of the business name and then do a fresh company registration even at that you still need to file your annual returns up to date. If you still decide to go ahead with the business upgrade its absolutely fine, at least you have been properly guided.